June 7 2015: New video added, see bottom of the page: Testing FT 991 on 2m. Wilko PA1WBU already wrote a few articles for the PA2OLD website. 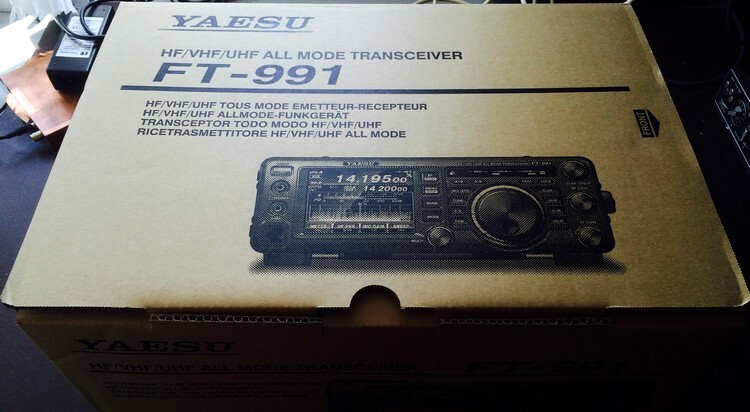 Here is his newest; a user review of the new Yaesu FT-991 radio, the successor of the Yaesu FT-897D radio. One of my friends, Robert PE1MJA, recently decided to buy his first ever HF transceiver. Amongst other uses he wants to take it aboard of his 26ft sailing vessel when he sails on the open sea, in other words outside of VHF mariphone range. This use case means that space is at a premium, the FT-991 having a built-in antenna tuner is a definite plus. Obviously the transceiver should be rugged and reliable. Having VHF and UHF in the same box is obviously nice to have too. So, the FT-991 was duly bought and delivered. Robert for personal reasons does not currently have the time to start using it himself, so he turned up on my doorstep with the unopened box, telling me “have a go, and tell me if it works and if you like it or not”. Obviously not an offer to be refused ! Do note: I have no pretentious claiming my ‘kicking the tires’ is a real / scientific test, rather it is a very subjective impression. In other words, my testing was limited to phone use only. This does not do the FT-991 full justice, given the extensive built in functionality for digimodes and computer control (CAT). 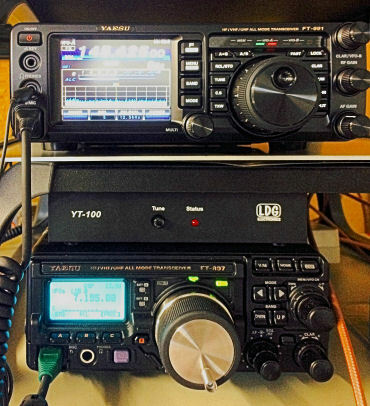 The FT-991 is a nice looking rig, a bit wider than the FT-897. The bigger box holds a built-in antenna tuner which is nice, less clutter with loose boxes and cables etc. is always good. It has a neat colour LCD with touchscreen functionality. It altogether looks much more modern, more computer age than the rather utilitarian FT-897. The FT-991 pushbuttons are made of rubber, I personally prefer the feel of the FT-897 pushbuttons, they have nice click ‘feel’ to them. The FT-991 buttons work just fine though. Rotary knobs for AF, RF gain etc have a nice solid feeling to them. Better than on the FT-897. To my taste, the FT-991 VFO knob could have been a bit heavier, with higher inertia when you ‘give it a swing’. A cranker handle instead of the finger dimple would have been better too. On the photographs you will notice my own FT-897 has a non-standard VFO knob. I DIY-ed that on the lathe from high-grade stainless steel. The FT-991 touchscreen with softbuttons for obvious reasons takes central stage in operating the FT-991. It takes some getting used to but the concept feels sound. It sure gives the operator a better overview than scrolling throught the menus using the old style FT-897 LCD. You can customise the locations of some of the softkeys to have your personal set of “most used” controls together. Nice feature, and easy to configure. On the physical side, the FT-897 case appears to be of a somewhat more rugged (‘MILspec’ style if you will) build quality but the FT-991 is not a ‘tin can’ either. Contrary to the FT-897 the FT-991 cannot be equipped with batteries (who cares?) or a mains powersupply module (which I do not have but do like as a concept). New owners are well advised to check the firmware of their new rig. Yaesu have produced multiple new firmware versions since first release. Our rig proved to have the latest version already installed. Good! The FT-991 is a child of the computer age, a scroll down the setup menu shows no less than 151 settings. Ugh. There is definitely time to be invested before one can expect to fully master this rig. Be prepared to read the 150 page manual! Yes, really! Fortunately the menu settings are quite clearly listed, the large display nicely solves the problem of the sometimes cryptically short abbreviations the FT-897 uses. Plenty of ports are provided to interface the FT-991 to various uses. It has a serial port usable for CAT or a GPS, it has a USB port that combines CAT via an emulated serial port as well as an audio interface for digimodes, it has a RTTY/Data port and it has a port for interfacing with an linear amplifier or an external antenna tuner. The touchscreen is something to try before buying. Some people love them, some don’t. I am not overly fond of the responsiveness of the Yaesu screen, it sometimes seems to ‘miss’ softbutton presses? A future firmware update might improve things? Maybe I am spoiled by high-end touchscreens on tablets and smartphones. HF output power is continuously adjustable down to 5W, so you can do true QRP with this rig. Curious about the S-meter I hooked up my R&S signal generator and fed the FT-991 some AM signals. The bar graph S-meter is an approximation of course. This is by no means a scientific experiment. If I would have had CAT control I could have measured more accurately. But not having compatible CAT software available to me made this impossible. The FT-991 started to pick up the signal at -132dBm, so well below S1. Sensitive it sure is. S1 on the FT-991 meter is about -106dBm which is in reality more like an S3-S4. S5 on the FT-991 is about a -95dBm, or between a S5-S6 according to the IARU. S8 on the meter is about an S7. S9 on the meter is S7-S8. S9+10 on the meter is an S9 on the R&S. S9+20 on the meter is an S9+10 on the R&S. For what this experiment is worth, it appears the S-meter is a bit optimistic. Nothing I think is worth worrying about. During one of the ‘Arnhemse AM-rondes’ on 2m I gave the FT-991 a try with AM modulation. Well.. now *that* was nothing to write home about. The reports I received were unflattering to put it very mildly. Reception on AM is just fine, but transmit appears to be very bad indeed. Audio was “bad”, “unintelligible” etc. So, if you have a desire to use AM the FT-991 is not for you. It could be that Yaesu comes up with a solution of course. Maybe it can be fixed with a new firmware version? At least for now AM transmission is basically useless. Currently there appears to be no support for the FT-991 in populair tools like Chirp. A look on the Yaesu website drew a blank as well. I wanted to upload the 2m and 70cm repeater channels for the Netherlands but that proved to be a no-go. Presumably this will be fixed in due time. Of course you can program memory channels/repeaters via the touch screen but that is just not my idea of fun.Yaesu recently have released the CAT information for the FT-991 which should help software developers write support for their software. My old HRD5 did not work (just had to try HI). The current version of HRD6 claims to support the FT-991, as I do not own HRD6 I could not verify this. The built-in antenna tuner can handle a maximum SWR 1:3 mismatch. As an (unscientific) experiment I setup a random wire antenna the garden with 1:49 UnUn. My antenna analyser showed me that this is not an easy antenna to match. The FT-991 was definitely not amused by the random wire. On 20m it tuned OK, on 40m it refused to tune. The LDG YT-100 on my FT-897 after some frantic rattling of relays had no problem tuning that same wire. Keep this in mind in case you use (or have to make do with…) ‘difficult’ antennas. Difficult antennas include mobile whips and popular antennas like the G5RV!Yaesu states in the manual: “… is designed to match impedances within the range of 16.7 Ohms to 150 Ohms … Accordingly, simple non-resonant whip antennas, along with random-length wires and the ‘G5RV’ antenna (on most bands) may not within the impedance matching range of the ATU”.In contrast the LDG YT-100 is specified for being able to tune between 4 and 800 Ohms. The Yaesu statement matches the experiences I made running my own experiment. The fact that the tuner only has 100 memories is also something I really do not get. Come on, the simple PIC microcontroller in the LDG YT-100 has 2000 memories, surely the much more advanced microcontroller(s) driving the Yaesu FT-991 can do better than 100? The FT-991 is equipped with an interface port for an external tuner, so you can work around the limitation. But that of course defeats the elegance of a single box solution, and adds another € 200 (Euro) or so to the total cost of the station. Whether tuners as used with e.g. a FT-897 will work with CAT control is unclear. I was asked if the YT-897 will fit mechanically. The answer is that the FT-997 does not have the same mounting holes on the left side of the box the FT-897 has. So no luck there. Well… that is something Yaesu where seems to have totally missed the point. Strange if you as me. The IF DSP providing continuously adjustable filter characteristics is very nice indeed! Getting the right feel for it definitely takes time but the reward is worth it: very nice audio, good noise rejection etc.. In general I love the power of the IF DSP, being able to filter exactly to your tastes and to accomodate varying band conditions is very powerful. Using the IF DSP filtering to reduce noise and QRM makes listening to a noisy band so much nicer and also much less tiring. Those into contesting will like that. There is also a sort of parametric equaliser in the microphone amplifier circuit which allows the operator to fine tune the ‘sound’ transmitted. Combine this with the speech processor settings and there is a lot to be (mis)adjusted, you really have to take even more time to experiment. Yaesu in their manual tell you that as well. I for now have left it at default settings which proved to work fine for me. Customising the softbuttons on the touchscreen to your own preferences proved easy using a sort of “drag and drop” approach. Settings are selectable per mode, so e.g. for SSB you can set other preferences than for CW. Very convenient to have those buttons visible that *you* want there! Transceiver on HF is OK. Nice, favourable reports for the limited number of QSOs sofar performed. The FT-991 gave me a couple of new DXCC already. Good. The Monitor function is really neat, it allows you to hear your own voice after speech processing. Adjustments to microphone gain, speech processor, parametric equaliser etc. are so much easier to make if you can hear the effect yourself. Of course a separate receiver tuned to your signal also does the trick, it is just less convenient. Playing with it I (re)discovered that tweaking compression etc. the wrong way can give you really weird audio. While transmitting the cooling fan comes on a bit early but it is less offensive than the FT-897 fans in its noise generation. On VHF and UHF FM I found the FT-897 giving me nice audio and favourable reports. Nothing to complain there. Compared to the FT-897 that maxes out at 20W you now also have 50W output on 70cm, in case you like/need that. The colour touchscreen is nice & clear but I am personally really less than thrilled by how responsive the touchscreen is. Probably because I am spoiled by hi-end smartphones. As far as robustness goes the touchscreen is bound to be more fragile than a simple LCD protected by perspex. DARES/RACES anyone? For home shack use probably not an issue at all. The display can be set as a spectrum monitor or as a waterfall display as known from SDRs. You can select an automatic update with selectable update interval. I have played with both and I fail to see the use for automatic updates. Every x seconds you loose reception when the receiver scans the band. Which is annoying no end. A spectrum monitor scan is more conveniently initiated manually using a touchscreen softkey. Amateurs making use of computer control for their rigs likely will have to invest time (and maybe money) to get their FT-991 working with their computer. I find it strange that Yaesu do not offer any software apart from a bunch of Windows serial port emulation and audio drivers. I admit, most people probably want their favorite tools to support the FT-991 but those tools are also not all supporting the FT-991 yet as far as I can tell. Some patience is most likely called for here.And plan for software updates which might cost you some money to obtain. Overall I definitely like the FT-991. It is a beautiful modern box, with lots of interfacing potential to computers and a nice fit for use with digimodes. Nice audio, nice powerful IF DSP functions etc. Just needs the software support needs to catch up before the full functionality becomes unlocked. That all said: I would not want to trade it for my FT-897 with separate tuner. So why not? Yaesu in my book should have put a better tuner in. And a better touchscreen too. The technology exists, has existed for years in fact. For this amount of money this simply should have been included. The FT-991 is more than a bit more expensive than the FT-897. In the Netherlands, even counting the expense for the external LDG tuner, the FT-991 is about a factor of 1.5 more expensive than the FT-897 plus LDG YT-100 used to be. Assuming I wanted to spend this amount of money I would *personally* go for a transceiver with more physical controls. Read: more knobs & buttons, so less dependent on touchscreen menus. Would probably make it a bigger box physically but I would be willing to pay that price. Knobs are just faster and easier to operate. Testing FT 991 on 2m by Waters & Stanton. Dit bericht is geplaatst in Japanese Radios. Bookmark de permalink.